Kolkata, Oct 24 (IANS) Odds-on favourites Brazil and England will look to brush aside last-minute logistical alterations and outsmart one another in a crunch semi-final clash here at the Vivekananda Yuba Bharati Krirangan on Wednesday. The match was supposed to take place at the Indira Gandhi Athletic Stadium in Guwahati but incessant rains forced FIFA to shift the game to Kolkata which will also host the final on Saturday. After inspection of the ground where Ghana and Mali had a rough time playing their quarter-final a few days ago, both teams decided not to fight it out on the soggy pitch and return to the city where the pair have tasted success. While Brazil rode brilliant strikes from Weverson and Paulinho to come back from one goal down and script a magnificent 2-1 victory against Germany in the quarter-final, England was perfect in all three of their group F matches scoring as many as 11 goals and leaking just two. In the round of 16 encounter, the Young Lions shaded Japan on penalty shootouts after the regulation time finished goalless. 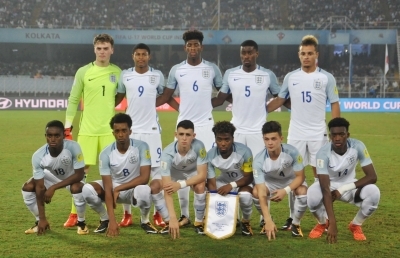 England, playing their first u-17 semi-final, have dazzled up front even without attacking midfielder Jadon Sancho who flew to Germany after the group stages for club commitments with Borussia Dortmund. While Sancho made his Bundesliga debut over the weekend, the likes of Rhian Brewster, who netted a hattrick in their last-eight engagement against the US, Phil Foden, Callum Hudson-Odoi and George McEachran made sure his absence did not affect the team. Manchester United’s Angel Gomes started in place of Sancho in the last game wearing the captain’s armband and is expected to do the same on Wednesday. Irrespective of the result against Brazil, England will play six of their seven games in Kolkata with the third-place-match also scheduled here. The Steve Cooper-coached European U-17 runners have the upper hand in terms of knowing the Yuba Bharati Krirangan turf better than their opponents. The only difference this time would be the atmosphere. Having so far revelled in the support of the fans, England now have to cope with the expected full house at the colossal venue vociferously supporting Brazil once again. The three-time champions, playing their seventh u-17 semi-final, are high on confidence after the morale-boosting quarters win. Carlos Amadeu’s charges have their decks full with individual talents like Paulinho, Alan, Lincoln and Brenner lighting up the tournament so far with their silken skills. In goal, Gabriel Brazao has been the tourney’s best keeper. Despite conceding a penalty in their quarter-final win over Germany, the Cruzeiro custodian has been difficult to beat in India with a save rate of 88.9 per cent. He is yet to allow an opposition player to find the back of his net from open play. The playing style of both top-heavy teams have revolved around their passing game and quick build-up in the final third. “Brazil play like European teams,” German coach Christian Wueck had said ahead of their last-eight clash. Brazil have the obvious advantage of their players capable of producing moments of magic. On Wednesday, with the crowd rallying behind them, the Samba boys would look to seal their fourth final berth. For inspiration, England have their U-20 boys who won the World Cup earlier this year. This will be the third face-off between the two nations Ain tournament history. While England triumphed A2-1 at Korea Republic, 2007, Brazil won 1-0 in Chile, 2015. Brazil: Gabriel Brazao, Lucas Alexandre, Yuri Sena; Wesley, Luan Candido, Weverson, Lucas Halter, Matheus Stockl, Rodrigo Guth and Vitor Eduardo; Alanzinho, Marcos Antonio, Rodrigo Nestor, Victor Bobsin, Victor Yan and Vitinho; Brenner, Lincoln, Paulinho, Yuri Alberto.